I have finished my blogs (out of sequence) on the first section of Matthews Gospel, chapters 1 to 7. I am continuing my Matthew’s Gospel explorations by skipping to the last section on the Passion of Jesus and his resurrection, chapters 26 to 28. The words, “When Jesus had finished all these sayings,” mark the start of this section. It is all narrative, there is no teaching section like in the other sections of Matthew’s Gospel, and the story of the Passion of the Christ is shown in a number of encounters between people. The story of the Passion as told by Matthew is all about relationships. The priests and people met in secret. The Sanhedrin, the Jewish high court who could impose any sentence except the death penalty, which had to be decided by the Romans, met in the Stone Chamber, part of Herod’s Temple. This group met in the High Priest’s palace, and so was not a meeting of the Sanhedrin, but a different group of plotters. Writing to Jews, Matthew is making the point about the informal, ad hoc nature of the group of plotters. The plot included members of the Sanhedrin, including the High Priest, but had no official status. Into the story comes one of Jesus’ most trusted companions, Judas Iscariot, the treasurer of the group of Jesus and his followers. What Judas’s motives were are not clear, but to have Jesus executed was not what Judas had in mind, as we will see later. The plotters were sneaky and were keeping their plans secret. 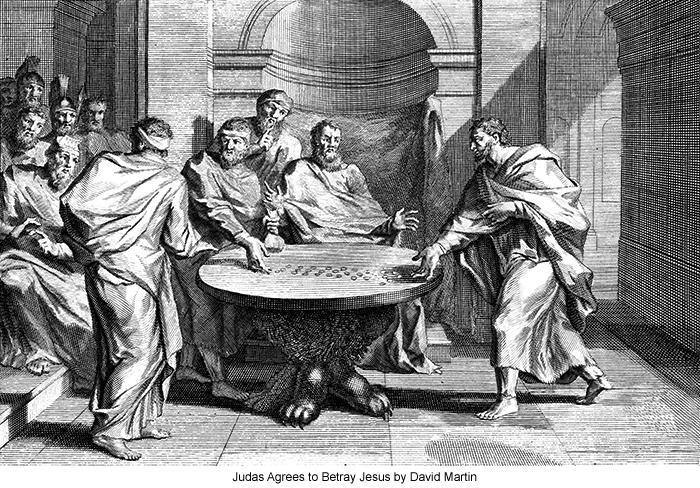 There is dishonesty being shown here, even by the Priest, and by Judas, who could be bribed.